"Simply delicious! A very unique combination of flavors for this oven char-grilled oyster recipe. It's so good, I get rave reviews every time I make them. People can't get enough of them. Great as an appetizer or the main course. Serving them on a bed of rock salt makes for a nice presentation." Preheat oven to 400 degrees F (200 degrees C). Place oysters in a baking pan, flat-side up. Stir butter, sriracha sauce, garlic, green onions, cilantro, and lime juice together in a bowl. Bake oysters in the preheated oven until they open slightly, about 10 minutes. Remove the top shell of the oysters using a towel and an oyster knife, being careful not to spill the liquor. Gently cut the muscles that attach the oysters to the shell. Divide the butter mixture among the oysters, placing a dollop on each. Sprinkle Parmesan cheese on top. Broil oysters in the preheated oven until butter melts and Parmesan cheese is golden brown, about 5 minutes. 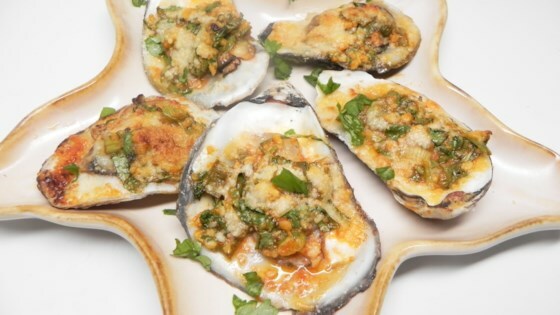 See how to make a rich, decadent Oysters Rockefeller appetizer! You can cold-shuck the oysters if you are good at it, but the oven easily makes them pop slightly open. This can also be done on the barbeque pit if you prefer, but the oven is so easy. The baking pan can also be covered in rock salt to make a bed to support any oysters that want to tip and spill the butter and liquor. Loved these! Perfect as written!